The second debate was held last Sunday in Cebu, and there were issues with some candidates even before the debate started – that made it start almost two hours later than the original time. Though we were infuriated, it was well worth the wait. The candidates came out swinging, and showed us how a Republican debate can be done locally. The format was a bit confusing as any candidate could just speak at any time, but hey, it made good television. And even the pre-debate banter (subsequently released by TV 5), was worth watching – though like I said on Twitter, I am on the fence about them releasing that, as it was very controversial. But, after all that, do you already know who to vote for? Here are some positive points per candidate, as told by them. Focusing only on the positive. If you want the negative, just open Facebook. Binay: He has the experience. From decades of public service in Makati, and then housing during his Vice Presidency, he can get things done. Duterte: He has the political will. He made Davao safe (from being no-man’s land). He can stomp out criminality and he won’t take prisoners. Poe: She brings a fresh perspective. She has no debts to pay in terms of political favors, and she has the pulse of the people. Roxas: He has continuity. The gains and progress made by the Aquino administration will be continued and strengthened by him. Santiago: She has the youth. Her connectivity to the young people, and her banter with them has made her the darling of the young. It is a bit simplistic, and clean (considering leaving out the cons of each), but these are basically their messages. Who are you leaning towards? 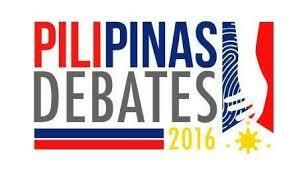 For the TV5 debate, hats off to Cheryl Cosim and Luchi Cruz Valdez. Cheryl did a great job keeping everyone tuned in while we were waiting for almost two hours waiting for the debate to begin. And Luchi was that older sibling that was putting her younger siblings in line when they started fighting. Kapatid talaga. Let’s see how the VP debate, and the third Presidential debate goes. Though for the ABS CBN debate, it might be only Duterte who will show up, after the beating the other three got.